Urinary analysis is an indispensable tool used to monitor patients who are either prescribed opiates or recovering from opiate addiction. 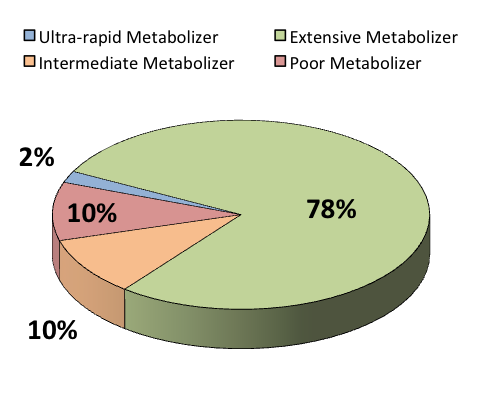 Interpretation of urinalysis results can be challenging, particularly when patients are taking opiates with complex metabolic pathways. This is further complicated because not all patients metabolize these drugs in the same way. Factors such as diet, drug-drug interaction, and genetics can affect metabolism and, therefore, patient’s pharmacological benefit. 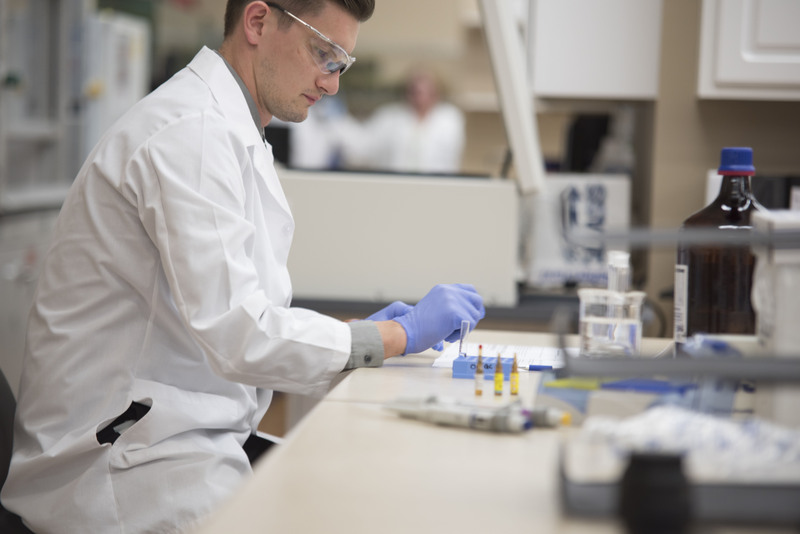 Thus, urinalysis results can provide insight into the need for regimen modifications. This monogram will discuss the variability of opioid CYP2D6 metabolism of hydrocodone and oxycodone. Hydrocodone (Vicodin®, Norco®, etc…) and oxycodone (Oxycotin®, Percocet®, etc…) are metabolized primarily by cytochrome P450 (CYP) enzymes, particularly CYP3A4 and CYP2D6 (Figure 1). Metabolism by CYP3A4 results in the inactive N-demethylated metabolites norhydrocodone and noroxycodone, respectively. The more potent O-demethylated metabolites, hydromorphone and oxymorphone, are produced by the action of CYP2D6. Oxymorphone and hydromorphone are typically found in smaller amounts compared to nor-metabolites, but they are five to ten times more potent than their parent drugs. Drug-drug interactions can have a significant impact on CYP2D6-facilitated metabolism (Table 1). CYP2D6 metabolizes not just hydrocodone and oxycodone, but also anti-nausea medications (Zofran®), tricyclic antidepressants, and other opioids. These substrates compete with hydrocodone and oxycodone for the ability to bind with available CYP2D6. Because of this, high concentrations of competitive CYP2D6 substrates (present either because of legitimate use or abuse) cause a decrease in potent O-demethylated metabolites. Some drugs not only compete for available CYP2D6, but actively impair the enzyme’s function, thus inhibiting the CYP2D6 pathway. 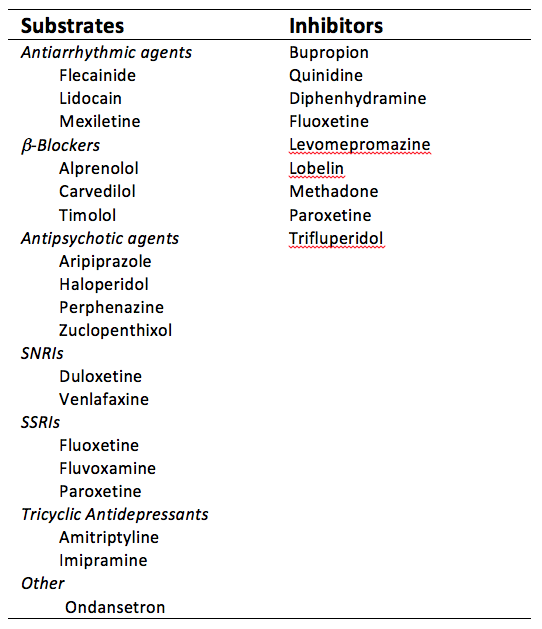 These inhibitors include such common drugs as Benadryl® and SSRIs (Prozac®, Luvox®, etc…) and can cause severe decreases in CYP2D6 pathway output. Genetic variations (polymorphisms) of CYP2D6 can also affect a patient’s ability to utilize this pathway. The gene that encodes for CYP2D6 can exhibit one of many polymorphisms that changes the way the enzyme is expressed. Though the exact percentage varies with ethnicity (Table 2), the vast majority of the population has normal CYP2D6 function. These patients are known as extensive metabolizers and intermediate metabolizers, respectively. In the Caucasian population, approximately 5 to 10% possess either poorly functioning or non-functioning CYP2D6 enzymes and are characterized as poor metabolizers. Such individuals will likely produce a much lower proportion of O-demethylated metabolites. Conversely, there is a small segment of the population (~1-2% in Caucasians) that inherits multiple copies of functional CYP2D6 genes resulting in ultra-rapid metabolizers (Figure 2). These patients may be susceptible to increased side-effects when taking CYP2D6-activated drugs like oxycodone, hydrocodone, and codeine. 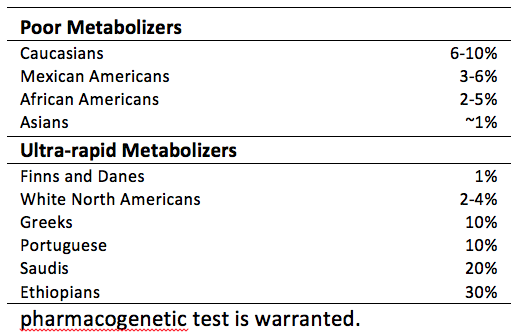 Urinalysis results can reveal differences in metabolism between individuals (Table 3), and may suggest that a pharmacogenetic test is warranted. 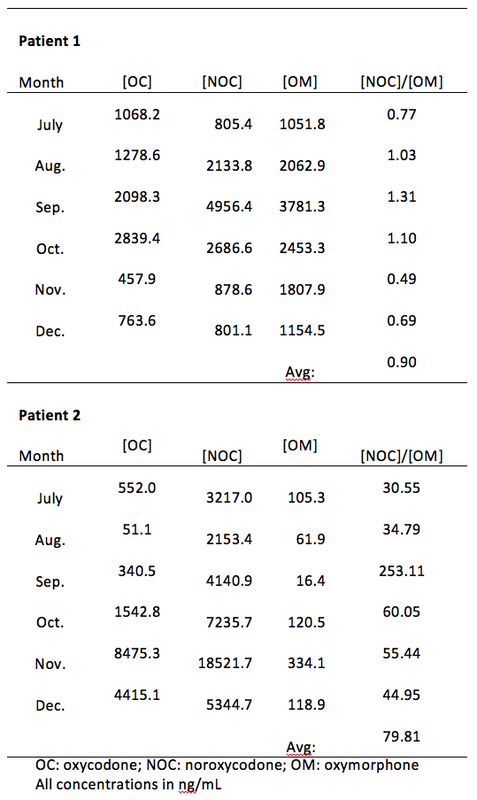 ‍The CYP2D6 pathway, and the variance it presents in a minority of patients, exemplifies the importance of considering patient history and context when interpreting urinalysis results. Such variance is sometimes explainable by genetics or drug-drug interactions and so does not necessarily indicate or exclude non-compliance. Individual CYP2D6 activity can affect the therapeutic benefit received by patients undergoing opioid therapy using hydrocodone, oxycodone, and codeine via suppression/enhancement of O-demethylated metabolites. Morphine, hydromorphone (Dilaudid®), and oxymorphone (Opana®) are pure forms of the O-demethylated metabolites, and are prescribed as an alternative to bypass CYP2D6 metabolism.